A silver Iron age unit of the North Eastern region / Corieltavi, c.50-20 BC, 'South Ferriby Boar' type. 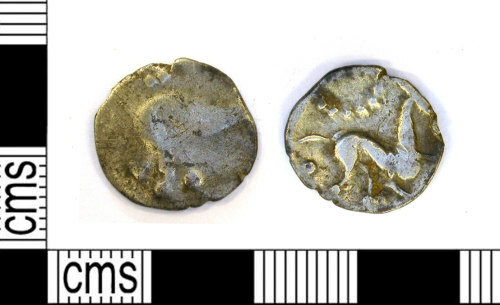 Obverse: Boar right, ring of pellets above. Reverse: Horse right, pelletal ring above. As ABC, p. 94, no. 1800; BMC 3214-3227; VA877. Obverse description: boar right possible pellets above? Reverse description: Horse right, ring of pellets above and pellet below tail.